This is what happens to a bowl of Cherrios, when it’s been sitting on the counter for too long. No time to put the cereal bowls in the sink during the morning routine. I’ll do it when I get back home you think. Then you go on with your day and only come home hours later… to this. If the video does not work click on the link bellow, I will fix it later. Just came back from the morning school drop offs. 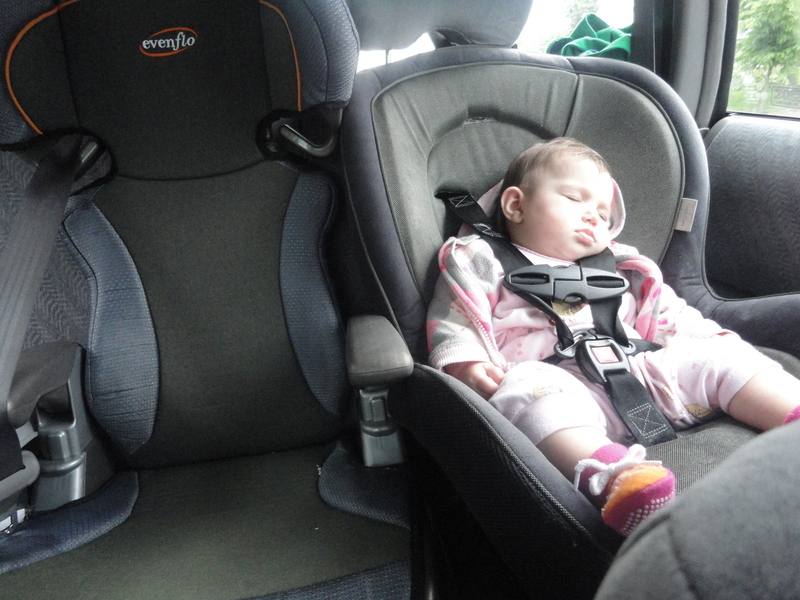 As I was driving back home I looked back to check if 6 months old A3 had fallen asleep in her car seat only to realize she wasn’t there! My heart stopped! I pulled over with a million scenarios going through my head. Did I leave her on the side walk somewhere? I glanced over and saw that she was sitting at the other end of the back seat in A2’s chair! I had put her there by mistake! The weird thing is that I even took the time to actually shorten the straps to tighten them. I was clearly distracted and not in the moment. She seemed tightly secured and had fallen asleep, so I continued my way. It often happens to me to be lost in my thoughts and lose touch of the moment or do things automatically out of routine. Just this week, I got in the car to head to the mall, but instead almost reached A1’s school before I realized I had taken the wrong route and never even thought about it. I’m realizing that we all do this; I’ve done it my whole life. But now that I have children, this is a time that I cannot get back. They will be small only once, so I better be in the moment! After all, this moment is the only one that is real. The past is gone and the future is still a thought and everything else is a distraction. So enjoy the now and be grateful for everything that has allowed it. I’ve learned that you can make things happen for yourself. Apparently if you are determined enough, the world could be yours. It’s kind of a scary thought… All I need to do is dream? It all starts with a wish, a dream. When I was younger I dreamt of many things. My dreams came true. Surely, they were more basic things. Career, love, family… Now I have new dreams, different dreams. What’s the point of calling it a dream if it’s going to be a realistic thing? If it’s realistic, then it’s not a dream, it’s an objective. I have the kind of dreams that makes people think “She’s dreaming in colors”. Well, who wants a black and white dream? A1’s dream is to fly. “I’ve prayed so many times to be able to fly but I’m still not flying.” She said. What do you say to that? “If you want to fly, then one day you will fly, you have to be patient” I told her. What else am I supposed to say? The “truth” ? I put truth in quotations because what is truth anyways? It’s just a perspective. I’m not going to shatter her dream and tell her she can’t. I”m going to tell her she can. I’m always going to tell her she can. Unless she’s asking me if she can sleep over at her boyfriend’s house at 16. In THAT case she can’t! If I share mine, will you share yours? We come into this world with no knowledge of it. We only know one thing, we know ourselves. We become children and learn more and more about simple realities of the world. Then we become fully informed adults. Fully informed about the realities of the world and we never stop learning. All this knowledge of the world is great. But we seem to forget the first thing we ever knew. We forget ourselves. We’re distracted by life and forget the true essence of who we are. Look inside, explore. Who are you? Do you really even know? I’m turning 30 this year and I’m still learning things about myself and I’m realizing that I still have a very long way to go before I can say that I know all that I am. You know your mind, you know your body. Who are you aside of your body or of your mind? Body and brain are matter, tissue, all physically tangible. What are you other than that? We’re born aware of ourselves and then we lose this knowledge along the way. A few months ago I blogged about how I wanted to break free of my body. How I didn’t want my body to decide for me how I should feel. How I didn’t want hormones, lack of sleep, work, stress or anything else to control me. I want to be in control of myself. I want to choose my emotions. I want to choose happy and that’s what I want to be. I was seeking for answers. When you seek, you usually find. I learned that looking inside you and connecting with the person you are within yourself can help you dissociate from your body. Does this make any sense? Is anybody following? Do you think I’m crazy? Basically I’ve found something that works for me and I’m sharing. I assure you my hormones are still raging, my exhaustion is at a peak that I’ve never known before and sleep is relatively inexistent. But I’m happy. Always happy. We think that children have trouble dissociating what is real from unreal. While we’re actually further from the truth than them. Step 1. Break free from your body by connect with your inner self. I’m don’t know because I haven’t finished it. That can be explained in a future post. We are lucky to have the capacity to take ourselves to wherever we want to go. Ball? That’s no ball! That’s the decoration from the plant… how did you get that? Mom I want an apple with chocolate! This is a regular snack for A1 and if you don’t present it exactly this way, she will send it back. I wasn’t kidding when I called her a picky eater. How to get a 20 month old to leave you alone for 2 minutes. I’m trying to do something on the computer. A2 won’t let me. She found out about the Power button on the laptop so she can be dangerous while you’re working. She already turned it off once and now she’s going for it again. So I reach in the air. I pretend I did and hold my hands in bowl shape. She reaches out and opens her hands. I gently place the imaginary bird in her hands and she leaves. Now I can get some work done. “Julie I’m hungry!” It’s Jack. Ahhh..where to start my child? My solution for not having to sweep the floors after every meal. Putting the carriage before the horses can stop the journey short. Or maybe a Vlog instead. Maybe I can start a Vlog. I’ll probably Vlog less often then I’ll blog. I should really think before posting. I would love to have my own radio show, but I don’t even know where to start. We could make it live. It could be fun. I didn’t put an exclamation point there because It, could be fun but writing it isn’t. La Fourmie worked while la Cigale slept. We don’t sleep. Life is too short. So basically my memory is so bad that I can’t even remember what the previous post was about. Ok now I’m starting to remember. So my mind is so tired that I can’t even manage to remember the most simple things or things that I’ve known my whole life. You see how bad it is? Anyways, I think I might’ve found something that’s really going to help me. You’ll know if it worked. If it works we’ll have structure in our posts. Or else I’ll be a mess as usual. And those who read are the ones who know if the writing has evolved.